Ben Belzer and Krishnamoorthy Sivakumar , l-r, associate professors in WSU's School of Electrical Engineering and Computer Science, researching technology that could lead to the next generation of computer data storage. More than 400 hours of video is uploaded to YouTube every minute, hundreds of millions of tweets are sent every day and trillions of searches are made on Google every year. Websites store these gigantic amounts of information in millions of hard drives, housed in massive data centers. A team of researchers from Washington State University is helping to take computer hard drives into a future where they could store a lot more data in a lot less space. 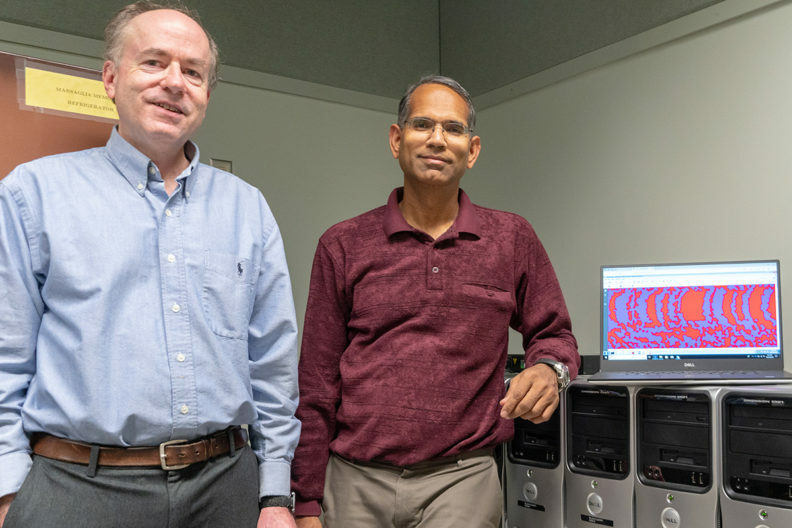 Krishnamoorthy Sivakumar and Ben Belzer, associate professors in the School of Electrical Engineering and Computer Science, received a $500,000 National Science Foundation grant to develop technology to more accurately read data from hard drives that are densely packed with information. A typical hard drive records data on a thin strip of magnetic material on the disk, and magnetic grains on the surface hold bits of the recorded information. As the volume of data grows, hard drive manufacturers are trying to cram more information in every square inch of the device. Currently, recording on hard drives is usually done on a single track, which limits the amount of information that can be packed into the device. “We have reached a technological barrier with storing bits of information on a single track,” said Belzer. Researchers are developing hard drives that can record data in more than one dimension, but these newer hard drives also present a host of new challenges. Recording in multiple dimensions means dense packing of information. At very high densities, some bits of information are not written to any magnetic grain. Furthermore, as more data is stored in the same area and the data becomes crowded onto the strip, interference from neighboring data create more potential for errors. Sivakumar and Belzer’s work will help ensure fast and accurate data reading of hard drives which record data in two or three tracks. The work will increase the efficiency of hard drives and help the industry store more information in a smaller space at less cost per bit. Using machine learning techniques, the WSU researchers are creating an algorithm that can learn from the disk signals when the hard drive is read. The team will then train the algorithm using simulated data. Eventually the algorithm will be able to learn what kinds of errors occur and then predict them. This will improve the ability to correct errors and ensure smooth and accurate data detection. “We want to detect the highest density of information possible with an acceptable error rate,” said Sivakumar. After designing their algorithms and demonstrating their performance on test data, the researchers plan to work with a magnetic storage industry consortium to implement their technology in commercial hard drives.